Some parents won’t let their kids play sports due to concussion risks. A new survey found that parents are also limiting their children only to certain sports because of head injury concerns. When more than 1,000 parents were asked if they’d let their kids play sports given the risk of concussions, 16 percent said no to all sports, a new Harris Poll conducted on behalf of the American Osteopathic Association found. While a little more than half of parents were OK with letting their offspring participate in a sport -- 51 percent said yes to athletics -- over a third of parents were on the fence, saying it would depend on the game. Of those parents, 66 percent said they’d allow their children to play basketball, 63 percent said baseball was a go, and 57 percent approved of soccer. Gymnastics (47 percent) and cheerleading (36 percent) were next in line. Parents who based their decision on specific sports would mostly bar their kids from rugby (only 6 percent would let their children play), hockey (12 percent), field hockey (16 percent), lacrosse (17 percent), football (18 percent) and wrestling (18 percent). 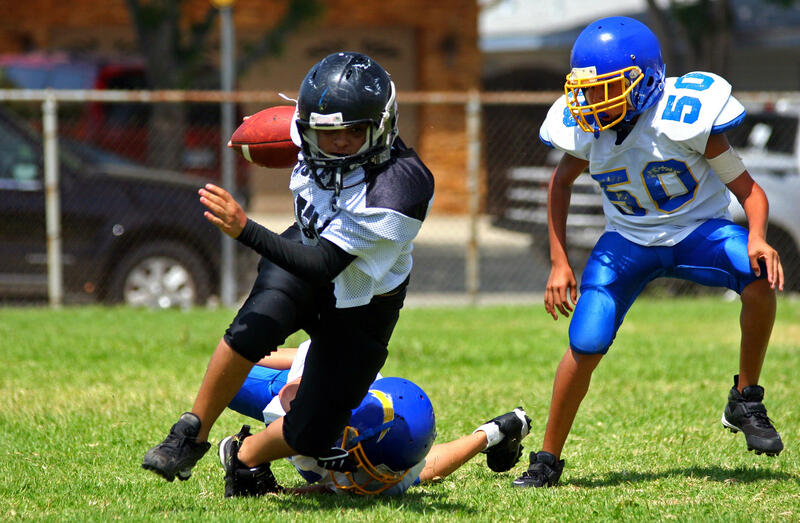 Moms and dads seemed to perceive the sports that involved protective equipment – football and lacrosse, for example – as riskier sports for concussions, Joelle Rehberg, an osteopathic sports medicine physician, told CBS News. There are probably some misconceptions, she said. “Parents aren’t doing their homework,” said Rehberg, who treats youth concussions at Atlantic Neurosurgical Specialists in Morristown, New Jersey. “Personally I’d be leery of cheerleading, to be honest with you,” she said, noting that she often sees cheerleaders in her practice who’ve suffered a concussion after being dropped. The media may have helped shape attitudes about sports and concussion risk, she said. For example, in higher level cheerleading events featured on television, the participants are often older, there are spotters for safety, and there are many young men at the college cheerleading level strong enough to catch their teammates when they are thrown into the air, Rehberg explained. But it’s a whole different ballgame at a middle school or high school football event. “Ten- or 11-year-old girls shouldn’t be lifting and throwing other 10-year-old girls. And when they perform at a game, it’s on grass or potentially a hard track,” said Rehberg. A study out last June in the journal Pediatrics estimated that between 1.1 and 1.9 million sports- and recreation-related concussions occur annually in U.S. children aged 18 and under. Football tends to get a lot of attention as a high-risk sport, but other sports may fly under a parent’s radar. “Parents need to be particularly aware of a heightened risk of concussions associated with girls soccer and girls basketball, according to a recently published study,” Dr. Robert Glatter, an emergency physician at Lenox Hill Hospital in New York City and assistant professor of emergency medicine, told CBS News. Part of the risk may be related to hormonal influences with the timing of the menstrual cycle and accompanying head trauma, he said. But adolescents with a history of migraines also seem to be at greater risk for developing more severe symptoms, research suggests. Staying hydrated, getting good sleep and developing strong neck muscles may also help young athletes prevent or minimize concussions, Rehberg and Glatter said. Even though many sports pose a concussion risk, parents who allow their kids to play sports say it’s because the lessons they learn on the field about teamwork, self-esteem and staying physically healthy outweigh the risks of concussion, according to the survey. To reduce head injury risks, moms and dads can help by getting more involved up front, before their child’s sport season launches, by asking their local recreation departments and schools if coaches are trained in concussion safety. Do they have the proper protective gear and does it fit, said Rehberg, who is also the medical director of the athletic training education program at William Paterson University. “If it’s a recreation program, check and ask what did the coaches have to go through. A parent should step up and say hey, if I’m not at a game I want to be sure the coach isn’t going make my kids keep playing if they get a head injury,” said Rehberg. The survey underscores that parents are making sports decisions for their kids based on concussion concerns, Dr. Jamie Ullman, director of Neurotrauma at North Shore University Hospital in Manhasset, New York, told CBS News. So it’s important that when concussions do occur, families, coaches and doctors all are on the same page -- that an athlete needs rest and for the symptoms to resolve before he or she heads back to their sport, Ullman said. “Once a concussion occurs, it is agreed that the athlete should not participate in the sport until the symptoms resolve. However, rather than prescribing full cognitive and physical rest, researchers and thought leaders are now endorsing a more active approach to concussion care,” said Ullman. “Active rehab” includes initiating aerobic exercise and specialized therapy when needed as soon as possible after a concussion to help speed recovery.